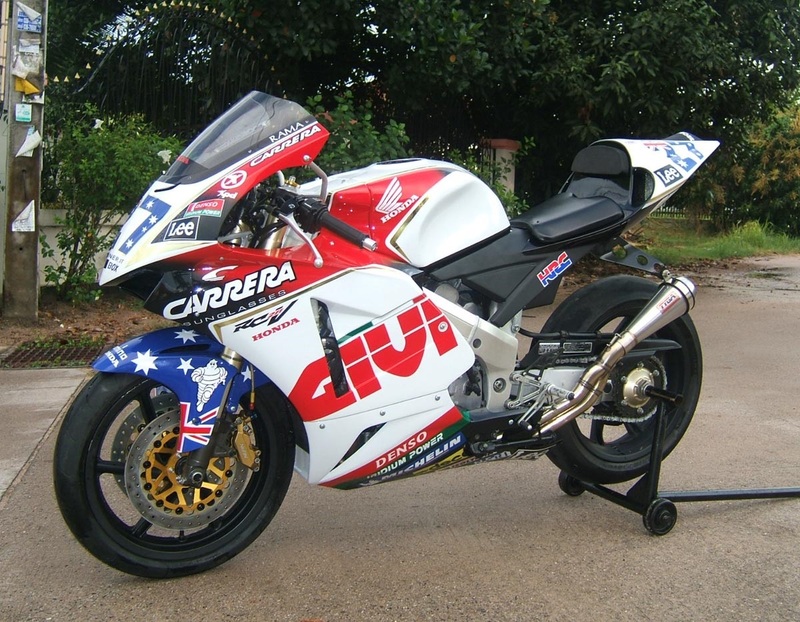 400 production racing is becoming ever more popular in the USA, Europe and Australia and, rules permitting, this project bike shows what can be done to transform a stock 1990s era road bike into a full on racer. 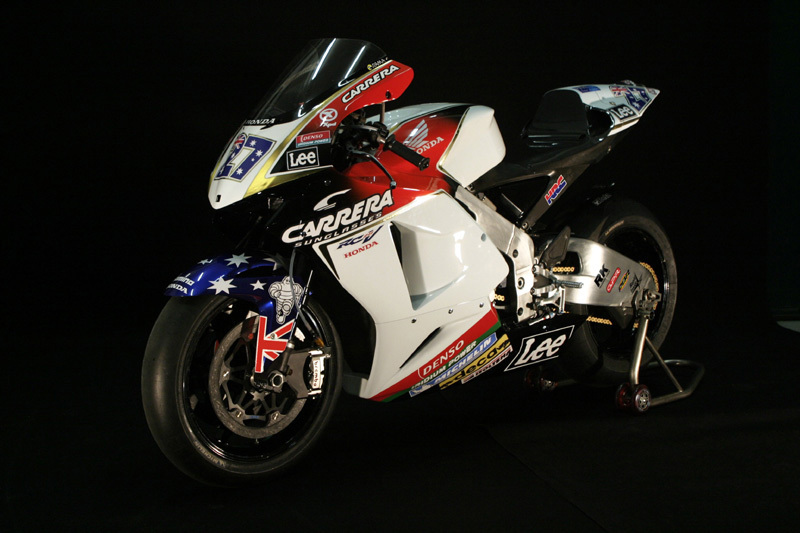 frankly speaking though, we won't be racing this beauty and we wouldn't expect anyone else to push it to the limit unless they had a generous racing budget. 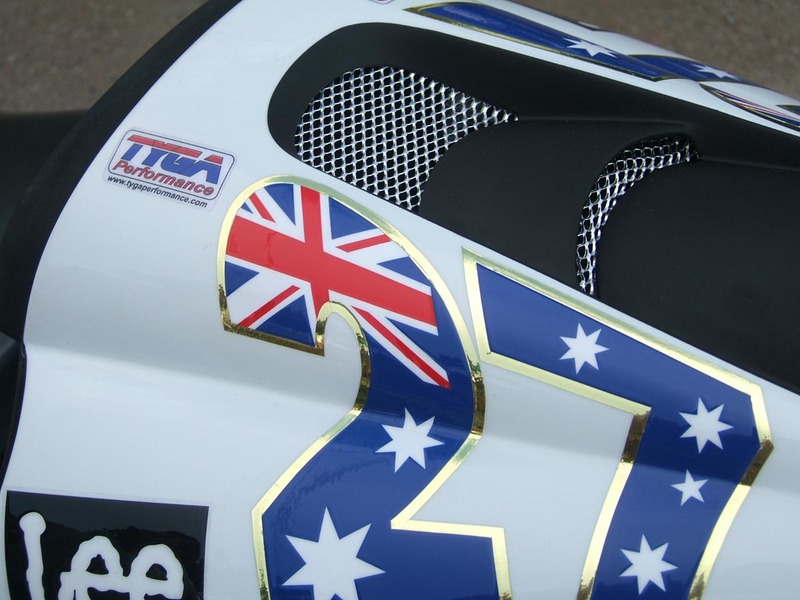 We built it to show our latest race bodywork off and to showcase some of our other existing products as well as introduce a couple of new things too that may or may not make it into production. So what is it exactly? 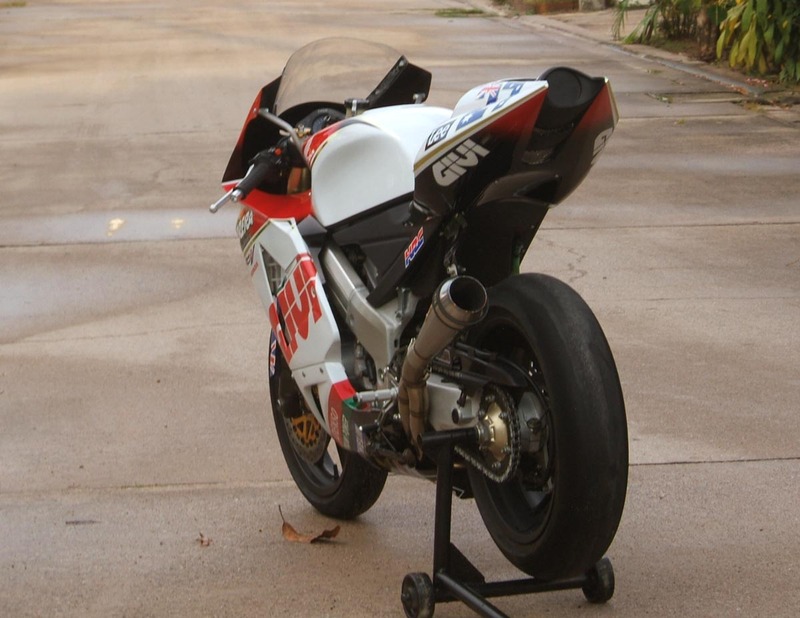 Well, it isn't an RC211V, that's for sure! But it will probably confuse people as it has more than a passing resemblance to one and even sounds like one too. 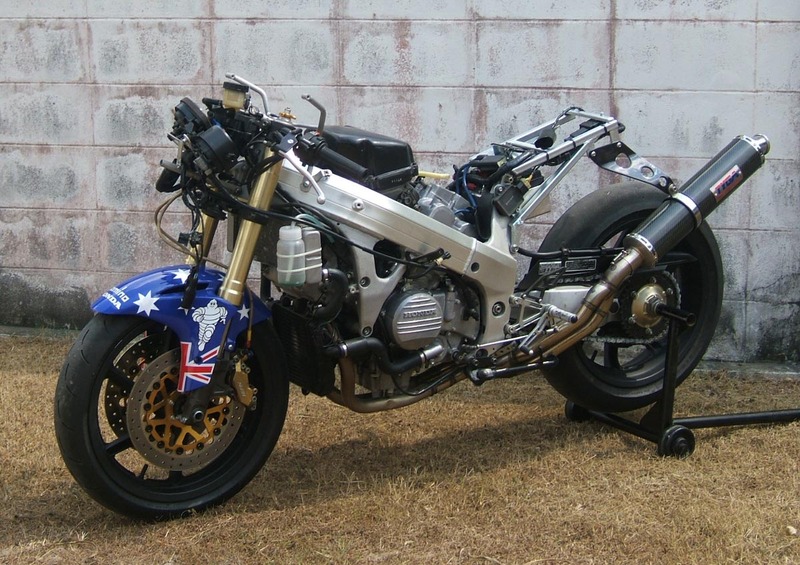 The rear swing arm is a giveaway and this bike was bought as a crashed stock NC35. We didn't need any of the stock bodywork or street gear so we managed to get the price knocked down about 25% by letting the dealer keep these parts to sell to someone else. 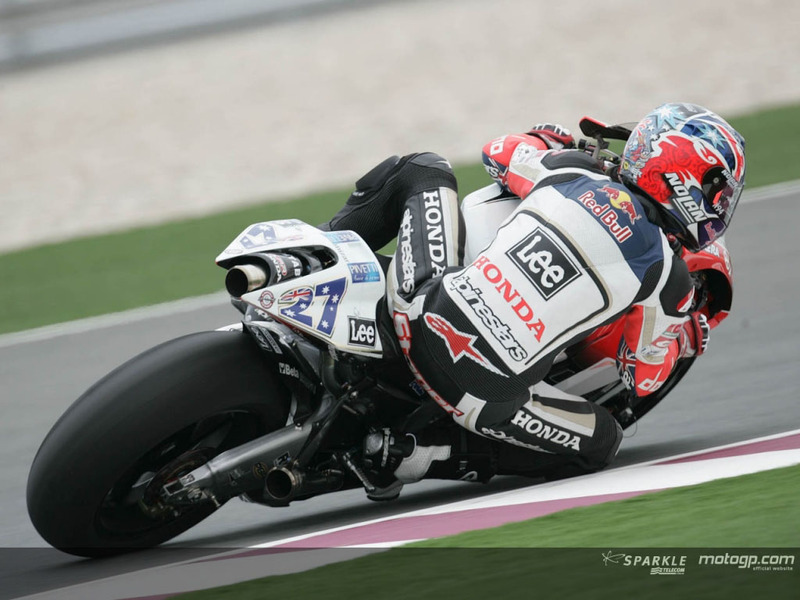 In this part of the world, lights and fairings are in short supply so he was more than happy. So we got a great deal with plenty of extra budget to turn it into something rather special. 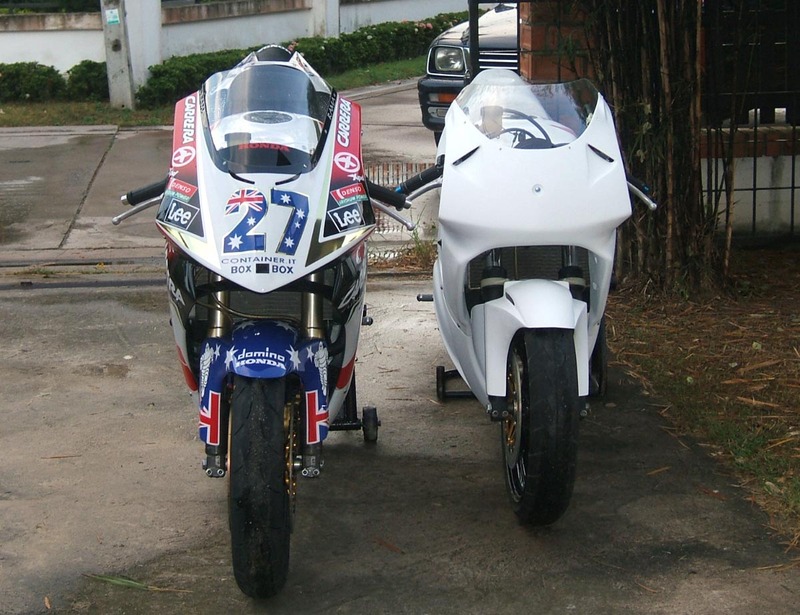 For any readers who are not sure what an NC35 racer would normally look like, below are some comparison shots. 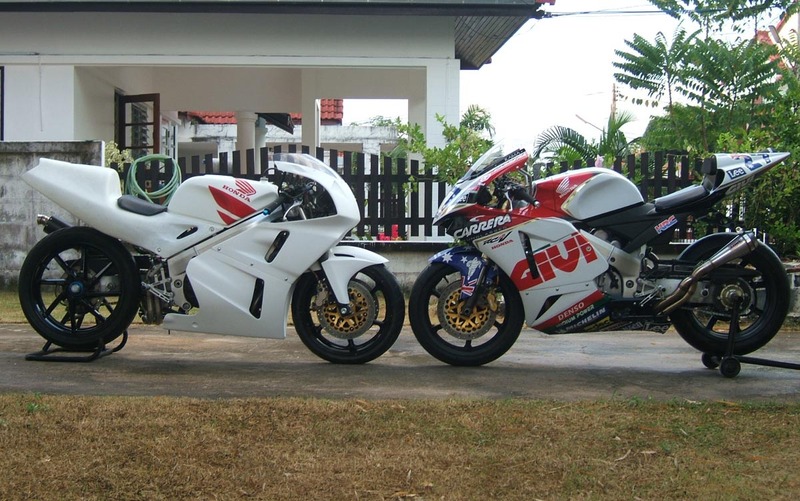 The white bike is actually an NC30 with our TYGA NC35 shaped bodywork fitted. 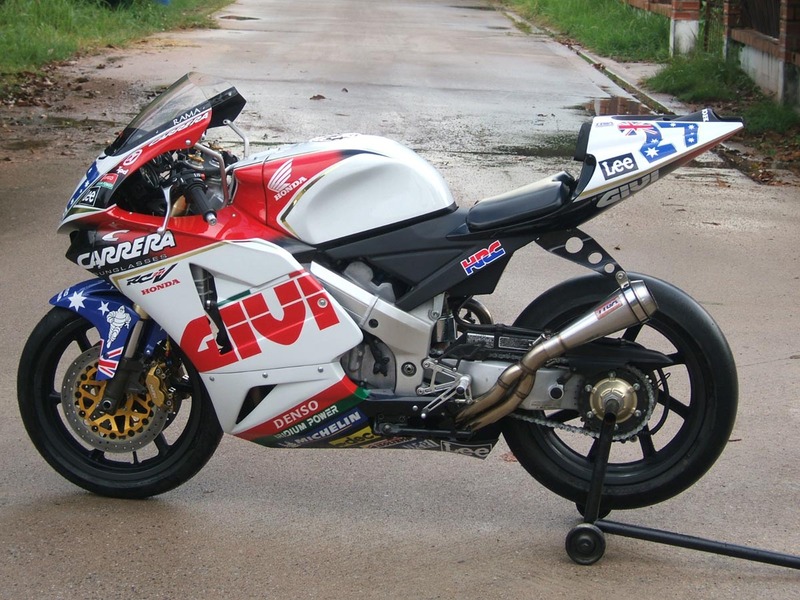 The LCR painted bike is our NC35 with our TYGARC211V style bodywork fitted. Confused yet? 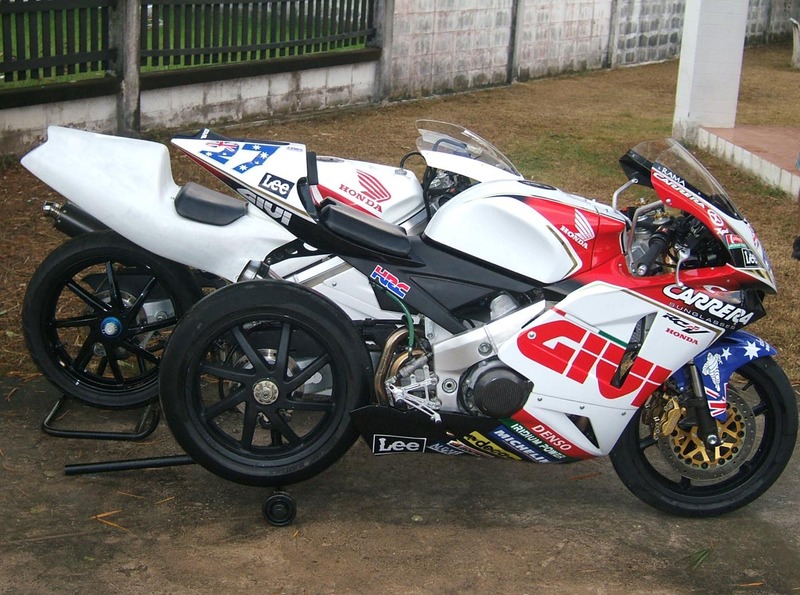 The most striking difference from the stock bike is the bodywork which is our latest RC211V kit. 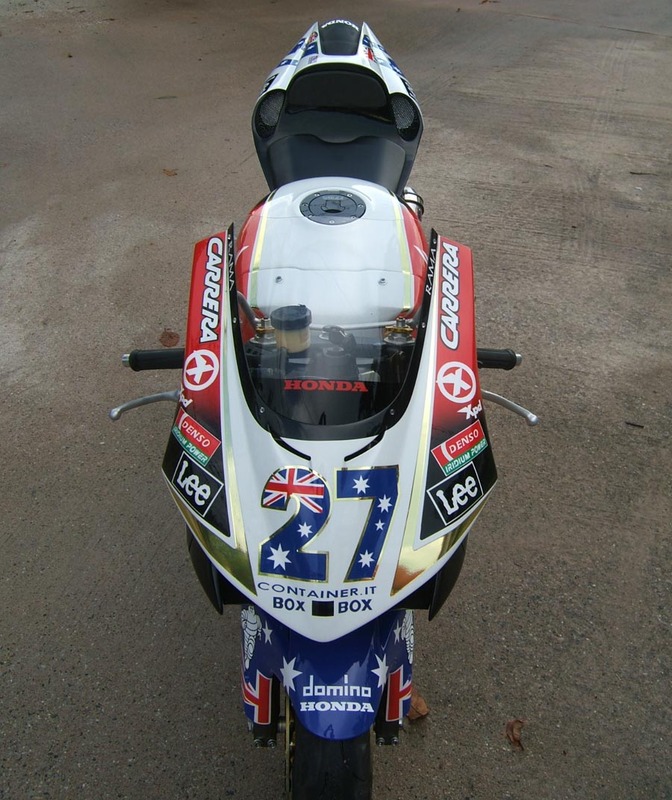 The front fairing and the front fender have actually been available for about a year now, but the seat cowling kit is all new and is modelled off the 2005-6 style RC211V with the round air ducts. 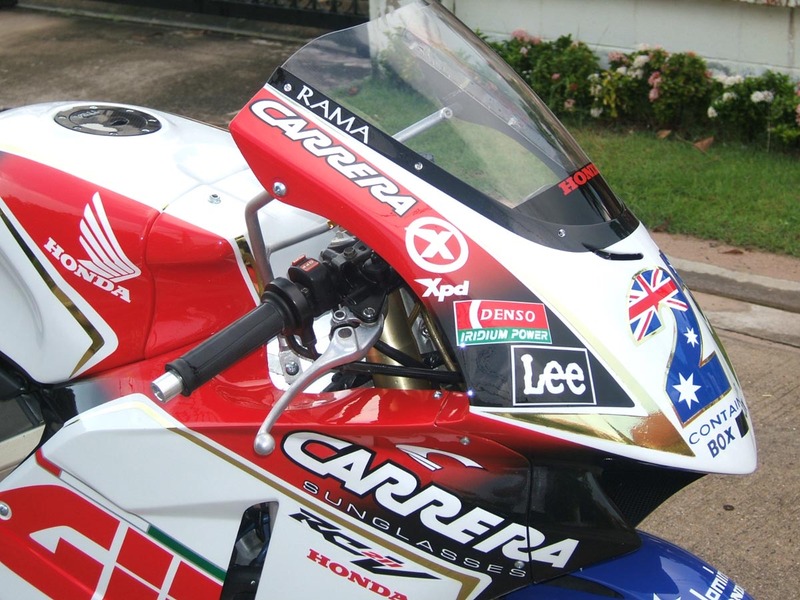 We incorporated a lot of improvements over the previous seat cowling such as styling enhancements, (shorter and sleeker), as well as made the components easier to fit with less bolts but well secured at the same time. 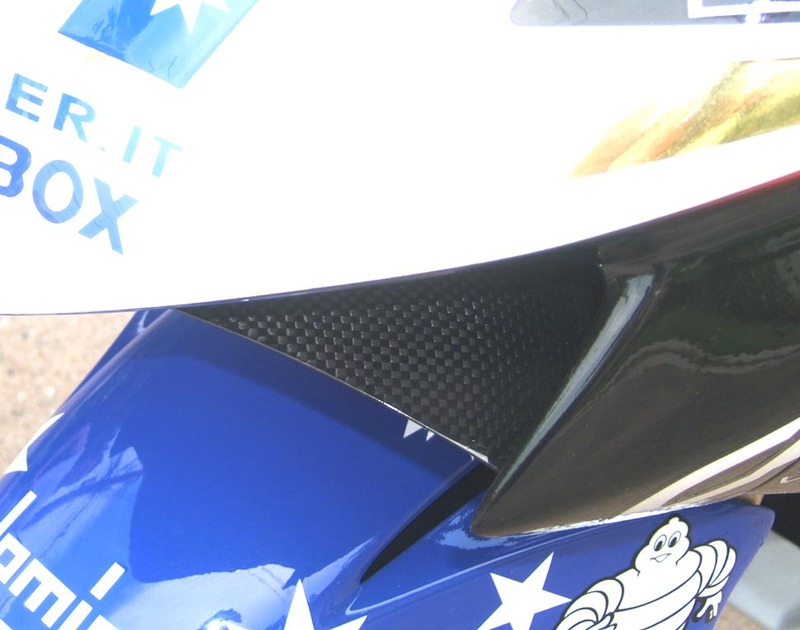 The kit is now supplied with a bum stop and mesh to cover the airduct holes which are now cut out to give an authentic GP appearance. 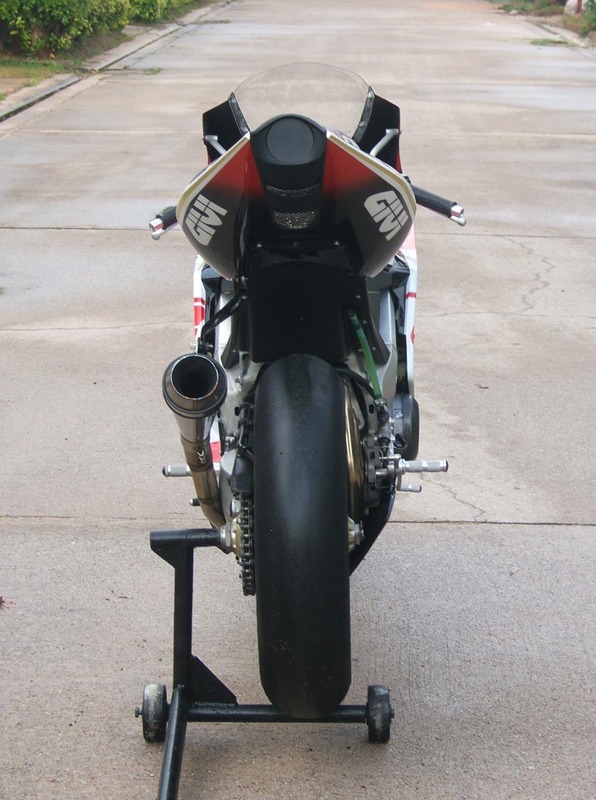 The tip of the tail has a round section which is used for an exhaust exit on the RC211V and for an LED taillight on our street kit. On the race version, this is left blanked off; at least for now. 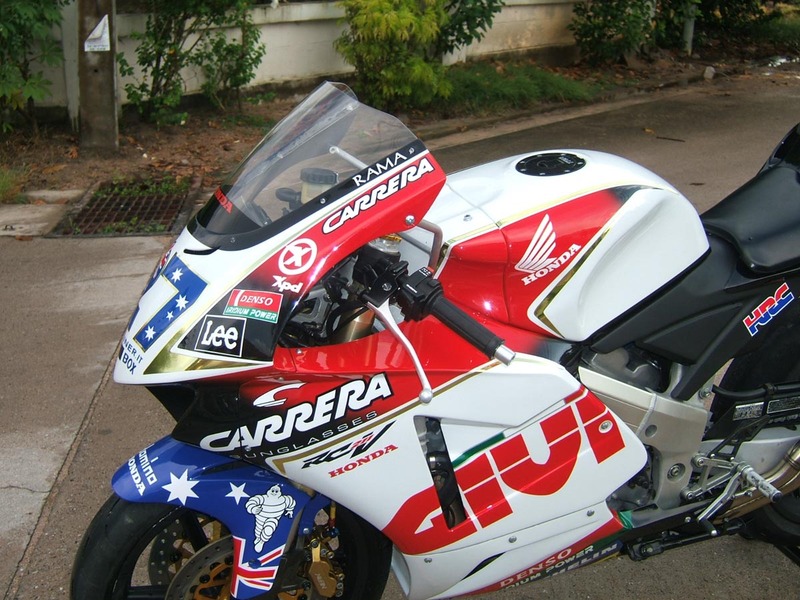 The paintwork we chose was Casey Stoner's LCR scheme for 2006. 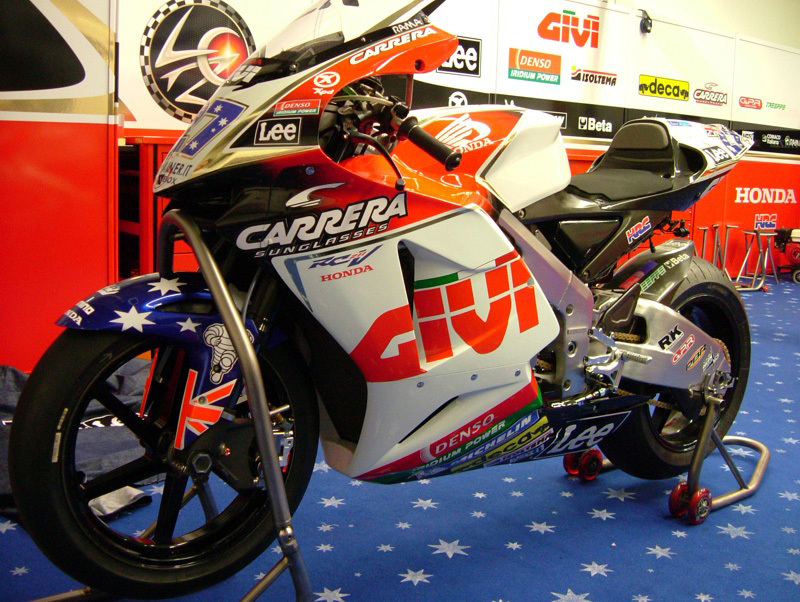 This scheme evolved somewhat throughout the year so we picked on a time when they had GIVI sponsorship and reproduced that. Our painter was incredibly patient throughout because not only was it his first Stoner replica, it was his first use of gold foil sticker. The first two attempts didn't come out as planned and the set took a while to get it how we wanted. As always, there are areas of improvement for next time such as slightly different sizing and positioning of stickers but we are more than happy with his work and he's keen to have a go at another set. 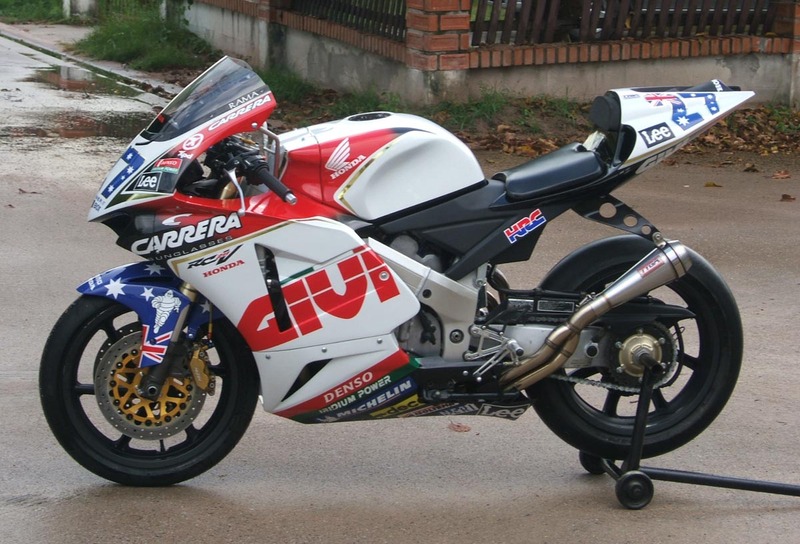 Naturally, it is not only the fairing which makes this a race bike. 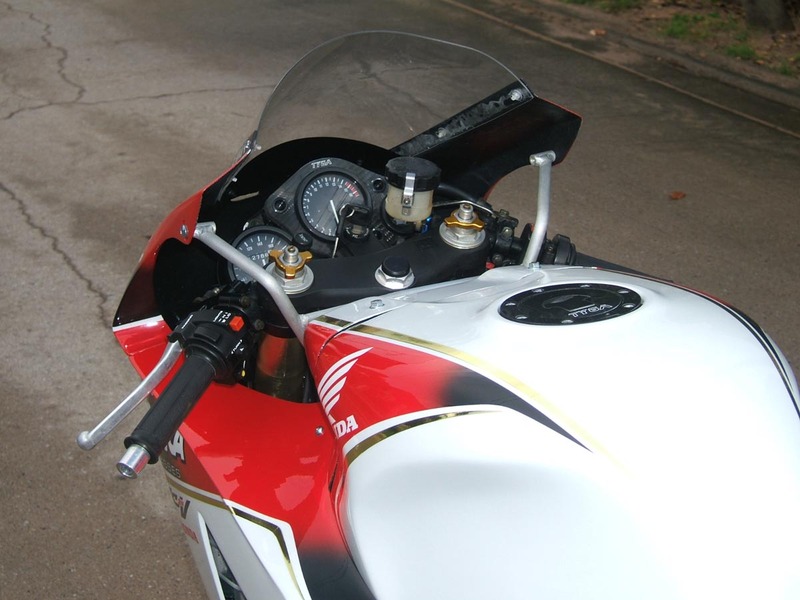 The bike has numerous performance enhancements. 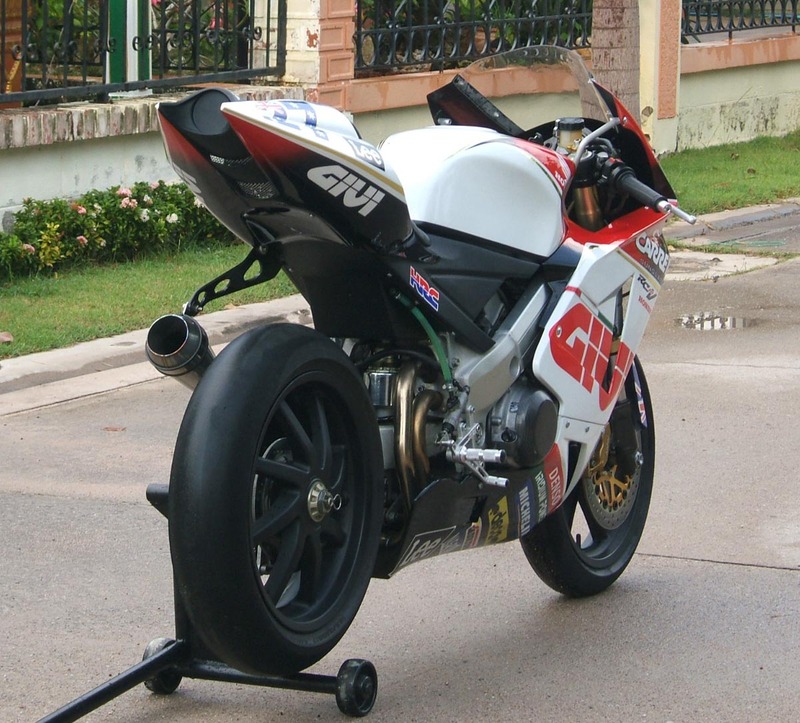 By now, you may have spotted the GP style silencer. This was done as a bit of fun and after a short discussion on how it would be nice to outblast the Harley's at a forthcoming bike meeting, within an hour Matt had the drawings ready and a couple of hours more, the stainless steel had been cut and welded into position and the whole silencer fitted perfectly. So how loud is it? 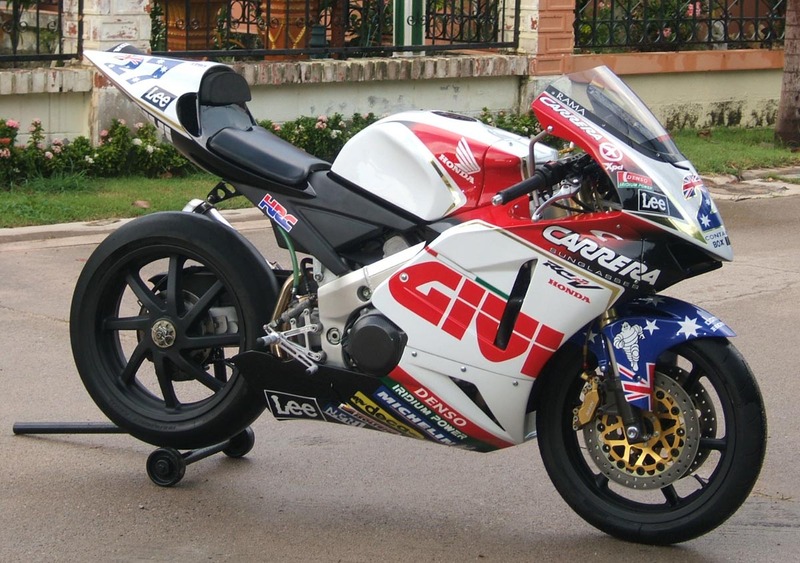 Well, like I said above, this bike not only looks like a GP bike, it sounds like one too! Luckily, we live in Thailand but even so, people scurry off the road (yes I did say road, as this is a street bike too) at the sound it approaching. Parking in underground car parks is guaranteed to set off at least a few car alarms and yes, we did get noticed at the show though I doubt any of the local Harley guys were particularly impressed. 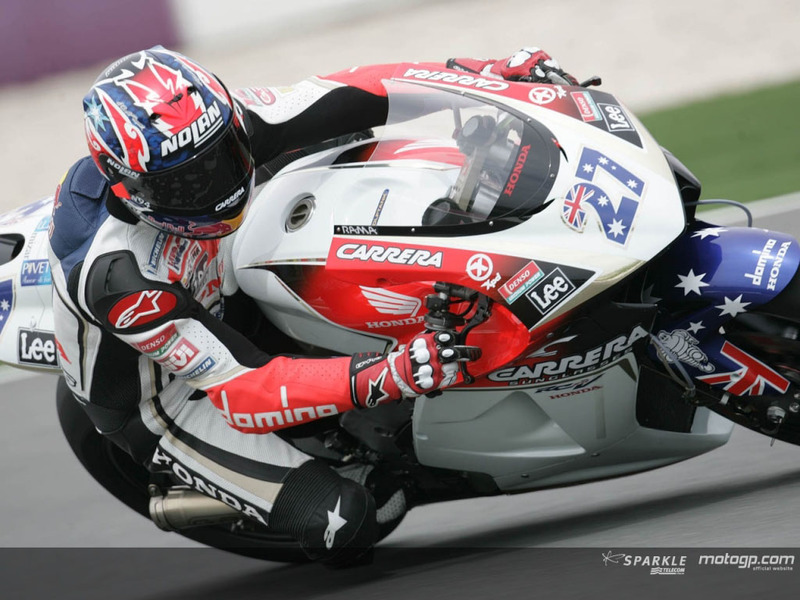 See all you guys again next year at the Sepang GP on your annual one day only ' We Love Japanese High Tech Bikes Day'. Hypocrites... Anyway, I digress. 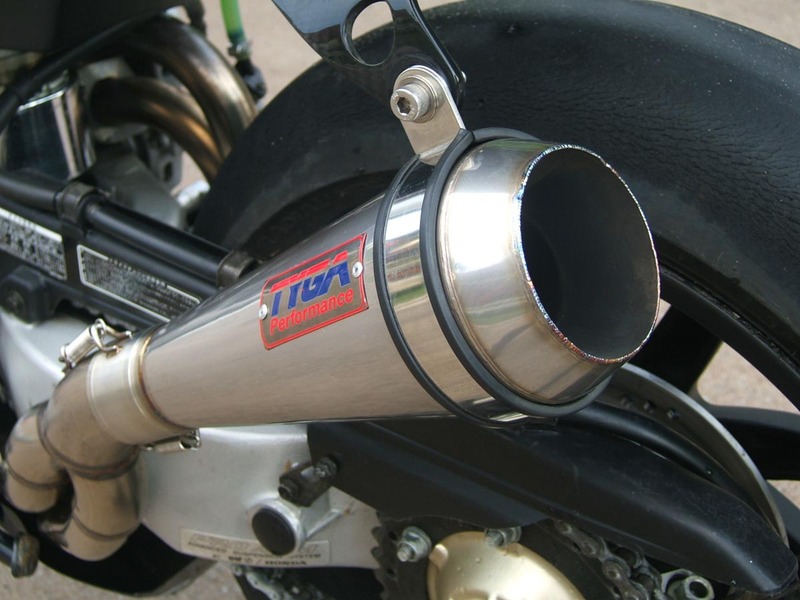 This silencer, doesn't silence. 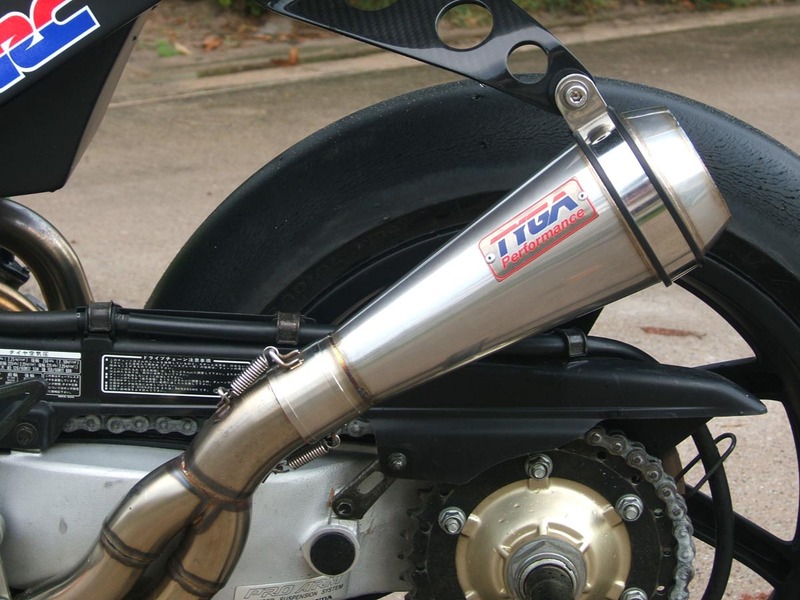 It just makes your bike loud. If anybody is interested in one, send us a mail and we may put them into production. Other performance upgrades are the usual to be expected for a TYGA project. 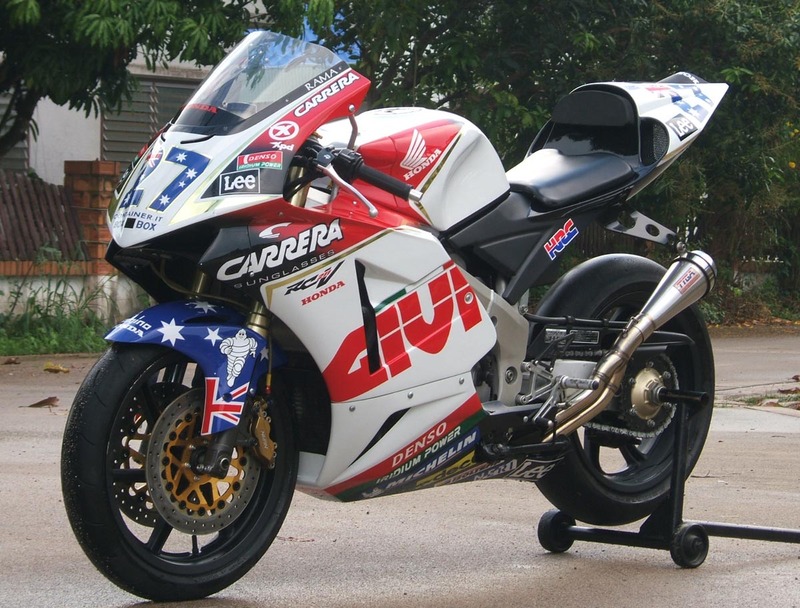 The bike has a few special parts from Honda such as an HRC CDI, jet kit, reservoir kit, radiator overflow bottle and Magtek wheels. The brakes are 929/954 calipers biting on cast iron rotors and braided lines with the stock master for now. 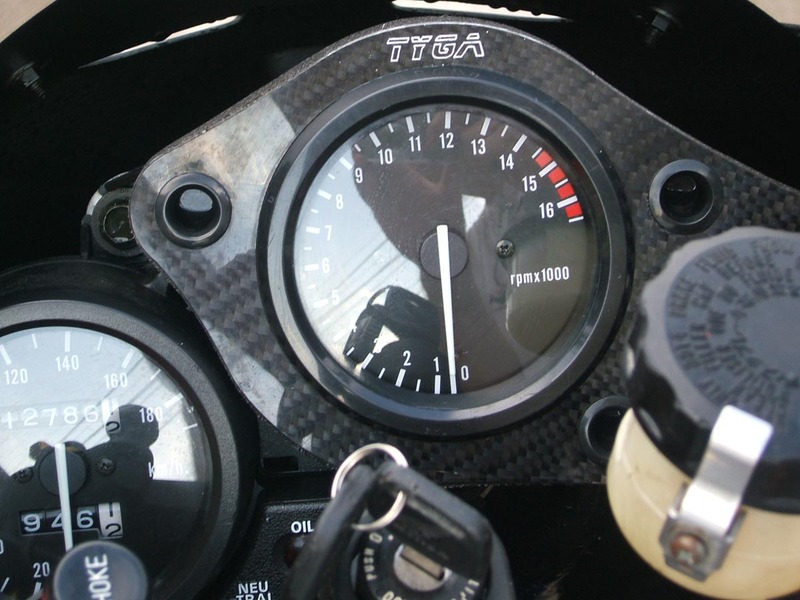 We fitted a Tyga step kit of course, plus a host of other little carbon bits and pieces. These were not strictly needed but gave it a trick look. 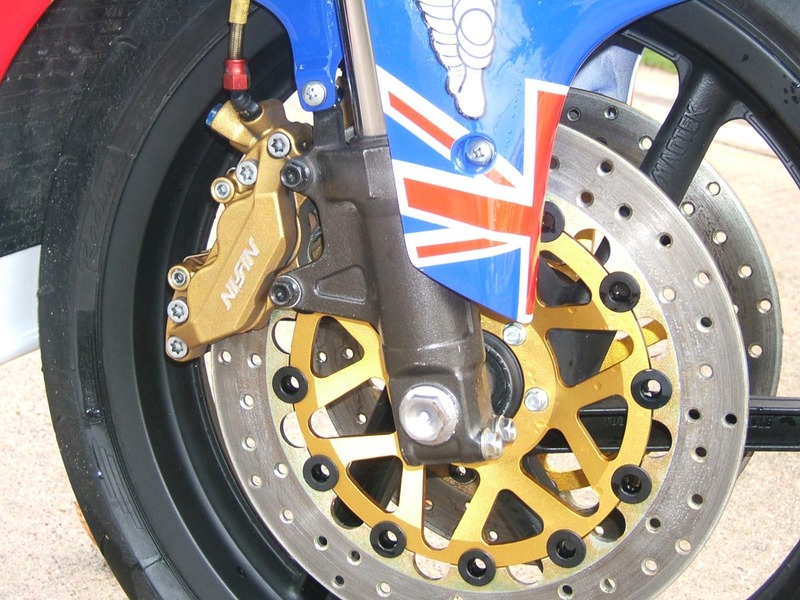 For a laugh and because the rainy season is now over, we fitted a rear slick. 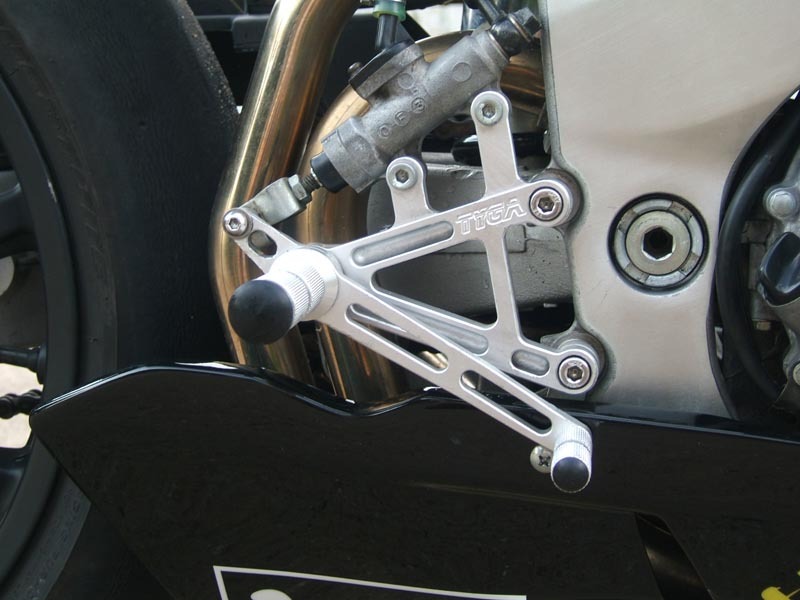 The great thing is, that because of the Pro Arm, the rear wheel can be changed in a flash if needed. The stand was designed in-house and works a treat. It is a lot easier to use than the heavy Honda ones we usually use and the wheels on it allow for easy movement in the garage. 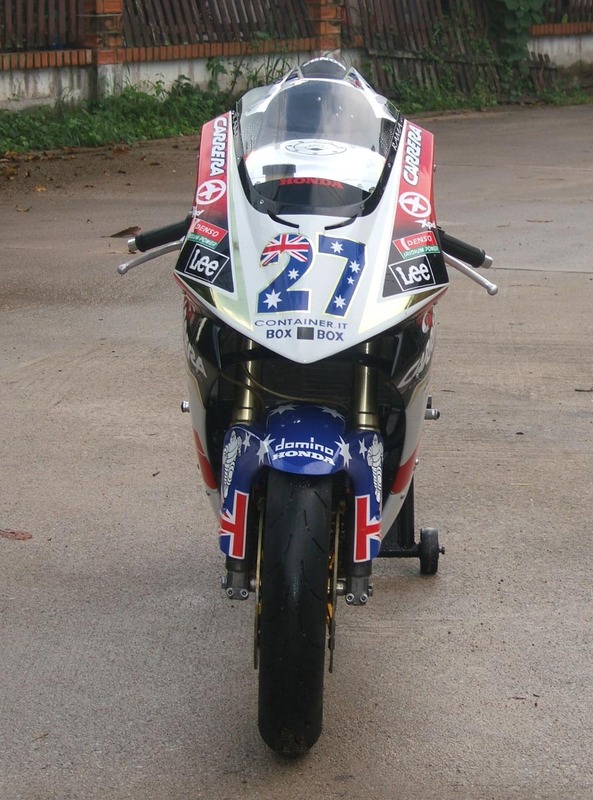 Finally, we thought it might be interesting to show you Stoner's bike for comparison purposes. 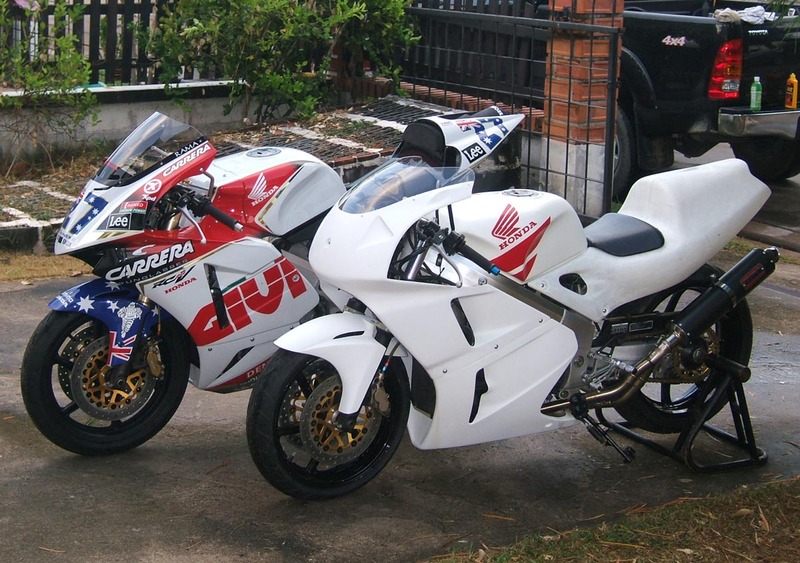 Sure it is not exactly the same and that was never our intention but we like to think that the theme is there and afterall, it did work out considerably cheaper than leasing an HRC RC211V like LCR had to. Please check out the bottom of the page to show the parts used in this project.